You might have heard that both the ASUS RT-AC3200 and D-Link DIR-890L routers are great to use in the home to be connected. The problem is which one you should choose as the ASUS vs D-Link router battle continues making it difficult for you to decide which one to buy. This is why we have decided to do a comparison for you on both these top-notch wireless routers to make it easier for you. The first and important thing you need to consider is how much devices you want to connect. This includes your smartphones, PCs, tablets, IP cameras and more. Then you need to consider if you have a large family and leaves you with a possibility of different devices that needs connection. With this in mind, connecting multiple devices to one router when active at the same time can degrade the performance.This is where the latest Tri-Band router helps you to broadcast three separate networks such as the AC322 from ASUS. On the other hand, the D-Link DIR-890L is also a Tri-Band model. 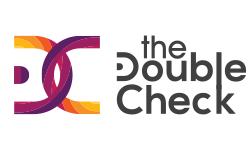 Both offer you two 5GHz bands to connect different wireless AC devices. In addition, both have a 2.4GHz network. The 5GHz band offers you up to 1300Mbps on each band with 600Mbps provided from the 2.4GHz bands.You will place your faster devices on the 5GHz network and the slower ones on the 2.4GHz band. However, the question remains which one of these routers are the best. Let us find out. Compared to the older RT-AC87U model from ASUS the new RT-AC3200 looks similar. The only difference is the recent model has two extra external antennas. The extra antennas catch the eye and it offers you tri-band use as mentioned before. Underneath the hood, there is a powerful Broadcom 5G XStream chipset. This chipset consists of a 1GHz dual-core BCM4709A with three BCM43602 offload processors. The chipset comprises of 256MB RAM. The device has an angular shape with a chiseled shape and slightly larger than its predecessor. There are six external antennas and each one-measure 8.27-inches long. This is a big router and has a heavyweight. You can mount the device to the wall with the included mounting points found on the underside. However, we would recommend placing it on a flat surface. On the front, the unit has a row of LED status lights and protrudes slightly, making it easier for you to see. There is also the USB 3.0 port found on the front covered with a dust cover. In our opinion when connecting external storage devices this would make for an untidy setup. Extra you can find two buttons to turn off the LED status indicators and Wi-Fi. On the back from left to right, you have the USB 2.0 port, the WPS button, a reset button, the GB Ethernet WAN, four GB Ethernet LAN ports, the power button and a DC-in jack. To help you with a seamless setup the RT-AC3200 has a helpful ASUSWRT interface and loads quickly. The software provides ease of use with advanced features. Included you receive the Adaptive QoS, AiProtection, and AiCloud 2.0. With the AiCloud, you can connect external devices and access them remotely from anywhere using the provided app. To keep your network and devices protected the AirProtection is an anti-spyware and anti-malware system to prevent hackers from accessing your network. There is a new feature present known as the Traffic Analyzer. This allows you to evaluate traffic and usage and great to see whose device is using the most bandwidth. Furthermore, it allows you to keep track of your kid’s internet usage. Another added benefit is the Tri-Band Smart Connect. This feature automatically assigns and manages devices to the different bands. To make it even unique the RT-AC3200 broadcasts all 3 of its 2.4GHz and double 5GHz networks as one SSID when enabled. The only problem is that some of the connected devices can suffer a lag if the router decides it needs to move a device around to maximize performance. You can configure the router to broadcast over three different networks if preferred. 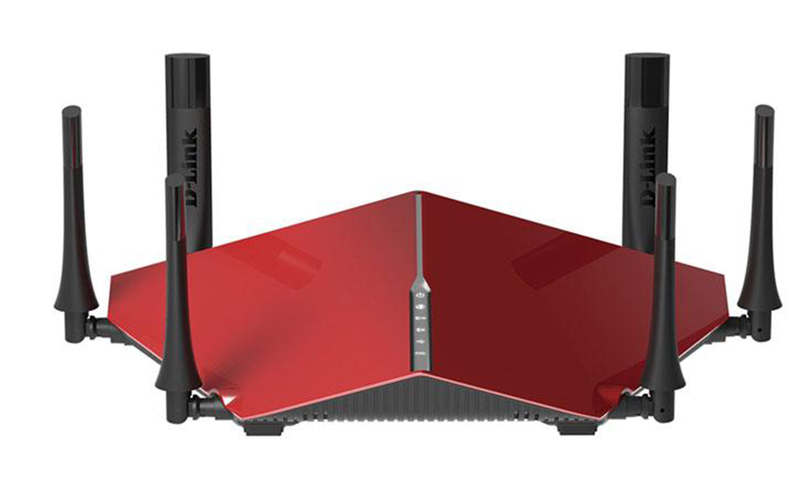 Next on our ASUS vs D-Link router comparison is the DIR-890L model. Compared to the ASUS RT-AC3200 this is also a massive device. You receive it in a bright red color and difficult to miss. There are numerous antennas. Under the hood is the same Broadcom 5G XStream chipset with a single 1GHz dual-core BCM4709A with three extra BCM43602 offload processors. Each processor dedicated to one of the three radios in the router. The chipset also has the same 256MB of RAM compared to the ASUS. In the middle of the router, you have a column of LED status lights. However, there is no indicator light for the GB Ethernet LAN port. When you look at the wireless router, it has a pyramidal design with steep sides. The external antennas are large and look as if it ready to take off and fly. This router is 15.75-inches wide and weighs in close to 35 ounces. On the front, you have the LED status indicator lights, wireless networks, and the USB ports. With the no status indication on the LAN, you will not be able to see when there is a connection problem. On the back of the device, you have the single GB Ethernet WAN ports, four GB Ethernet LAN ports, USB 3.0, and 2.0 ports. There is also the power button and the DC-in jack. On the rear, you can find the WPS and reset button and compared to the ASUS the D-Link DIR-890L arrangement of the USB ports are much better. Setting up the Wi-Fi router is a breeze and you can use it with the MyDLink app to use on your iOS or Android device. With the app, you can control and manage your home network remotely. There is another application available known as SharePort allowing you access to files on an external storage device using your smartphone. Once you enable the Smart Connect, the router only broadcasts over a single SSID. You can manage your devices manually over the three separate SSIDs if preferred. As with the ASUS RT-AC3200 model this one also has, the Smart Connect that automatically manages device connected. The router assigns devices to an efficient band. When it comes to the performance over the 5GHz bands both the ASUS and the D-Link matches evenly. However, the RT-AC3200 offers you a slightly better uplink speed while the DIR-890L has a better downlink performance. The truth is that both routers offer you a competitive speed at a 55-foot range. When doing file transfers the D-Link offers you an impressive speed and manages to offer you 156.86Mbps speeds at 55-feet. The ASUS offers you up to 125Mbps at the same range. Both the models offer excellent performance when automatically sorting devices to maximize performance when more than one device is connected. The D-Link manages to reach up to 210.53Mbps while the ASUS manages to reach up to 163.27Mbps. As you can see, the features are similar when it comes to both routers, but the ASUS does have the built-in security and is hard to beat. You get the useful Ai Cloud 2.0, Ai Protection, and Traffic Analyzer tool. With the lack of a remote management app, the D-Link stands out. 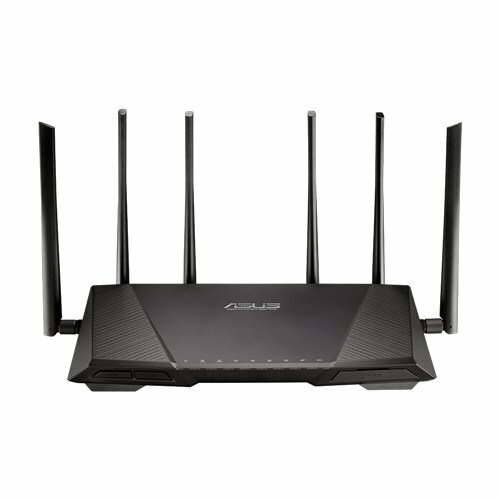 First, we hope that you have found our ASUS RT-AC3200 and D-Link DIR-890L router comparison helpful. Which one you should buy all depends on your needs and budget. 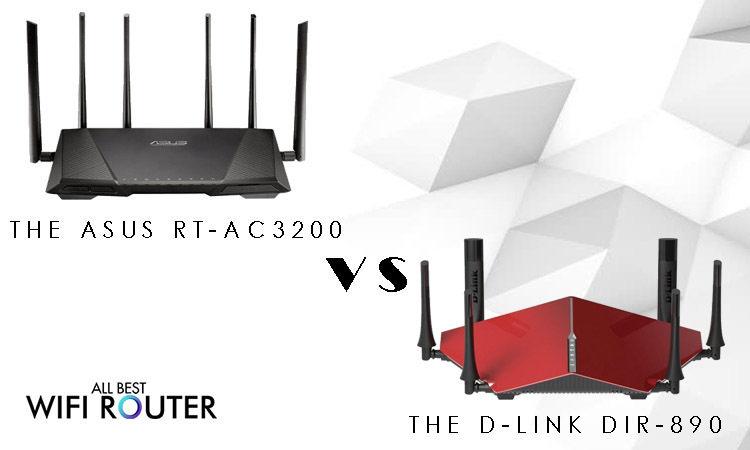 For a better performing AC3200 router, the D-Link DIR-890L is a better performer than the ASUS RT-AC3200 now. The download and upload link are strong and it performs well across all ranges. When under load it does not suffer degradation and is one of the more affordable models available. If you need the best performance and do not mind the bulky size the DIR-890L is sure to keep all your smart devices connected. The ASUS RT-AC3200 does cost more but offers less performance compared to the D-Link. The wireless router has astounding features, especially the Traffic Analyzer function. With this function, you can quickly see which device is connected to the network and how much bandwidth it uses. As a parent, you will love this feature allowing you to monitor your kid’s internet usage. The router might not be the best performer, but it is still a capable wireless router.